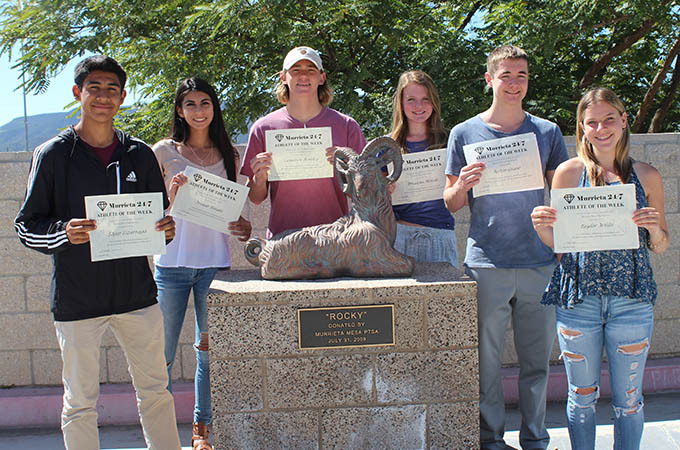 Week of March 6 honorees, from left: Edgar Lizarraga, Zeinab Torabi, Cameron Bentley, Brenna Moran, Justin Grant, Taylor White. Taylor White is in her second year on the varsity girls lacrosse team. She is captain of the team and was the Rams' leading scorer early in the season, averaging 3 goals a game. She also leads the team in draw controls and ground balls. "Taylor's stick skills and ability to catch/shoot/pass left- and right-handed have proven her to be one of the best in the league," said her coach, Molly Sovacool. "She has great field awareness and also is a powerful defender." Arianna Galindo is second on the lacrosse team in goals, averaging 3.5 per game. She plays a key role in causing turnovers and "is a strong presence on the defensive end," Sovacool said. Boys lacrosse player Cameron Bentley had 7 goals and 2 assists in the first two games of the season, including the game-winning goal in overtime in a 9-8 win over Great Oak. It was the first ever loss to a Riverside County team by Great Oak in 10 years. Zeinab Torabi of the girls track team "has started the season strong," said her coach, Aaron Ballou. "She is a versatile athlete and has set personal bests in both hurdle races. Zeinab brings to the team a great work ethic and great attitude and we are excited that she is a part of Mesa track. Edgar Lizarraga of the boys track team is a three-sport athlete who transitioned quickly from soccer season. "He has set personal bests in every race he has run this year and as only a freshman, we will look to him to help strengthen our varsity team," Ballou said. Tennis player Christian Daga went 21-0 in the preseason. "He continues to work hard on and off the court to be the best he can be," said coach Lisa Laney. Teammate Nathan Hormozi swept 5 of 6 games in one week en route to an 18-3 preseason record. Swimmers Brenna Moran and Justin Grant "have had to come back from injury or sickness that they were worried would affect this season for them, but both showed that they are back in shape by coming close to personal bests they had at the end of last season," said coach Jennifer Beech. "They have shown grit and determination to not let the trials they faced this past year get them down." Also honored from the swim team were Zane Bentley and Kate Fox. "Zane showed that even though a first-place finish may be out reach, if you race all out to the end, you can move up in position and score more points for your team," Beech said. "Kate showed how great of a teammate she is by stepping up and filling in on an event that she usually wouldn't swim but for the team. She was willing and raced all out for them." These athletes will be eligible for the March Athlete of the Month award. 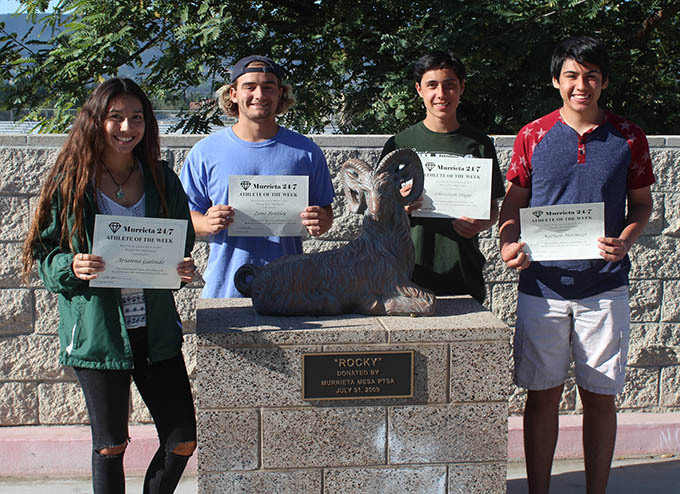 Week of March 13 honorees, from left: Arianna Galindo, Zane Bentley, Christian Daga, Nathan Hormozi. Not pictured: Kate Fox.